It was Steve’s turn to drive today and I got to ride in his suped up Subaru, pre-warmed on the chilliest start of the year. That was the plan anyway but having dropped the exhaust just before Lix Toll and having to wait for the very nice RAC man to come and provide a running repair we found ourselves frantically trying to contact Alan whom we were due to meet at Puffin Dive center to advise him of our delay and suggest we would join him in the afternoon. Four and a half hours after leaving Perth, we rolled into Puffin as Alan, Dave and Tam were returning from their morning dive off Maiden Island. Alan reported 1-2m vis and Tam reported a squall that had come through whipping the bay into wall to wall white horses. Dave and Alan had been blissfully unaware of this as they enjoyed a rather productive dive. Tam’s plight sounded only slightly more fun than watching the snow flurries at the Lix Toll garage. Lunch in the Crew room saw everyone warm up as general diving banter was hurled around and all too quickly it was time to venture out and load Alan’s boat for the afternoon trip. The plan was to dive a reef that Alan had found previously where a broken wall reached 45m some 20m off the shore. Located on the southern of two little points just south of Ardantrive Bay, east of Mount Pleasant farm and identified by a metal spike sunk into the rocks, Steve and I rolled off the boat into a layer of cold, fresh water. Final OK’s and we quickly sank to find warmer water. 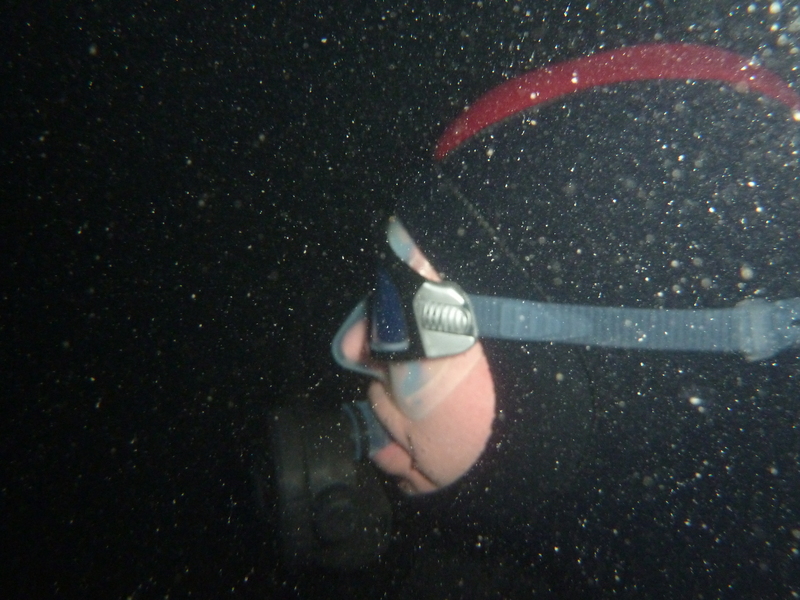 The dive was dark but some light penetrated down to 15m but beyond that a torch was essential. The broken wall was silty grey and had a scarce smattering of encrusting life but turned out not to be as dramatic as some of the walls in the area. 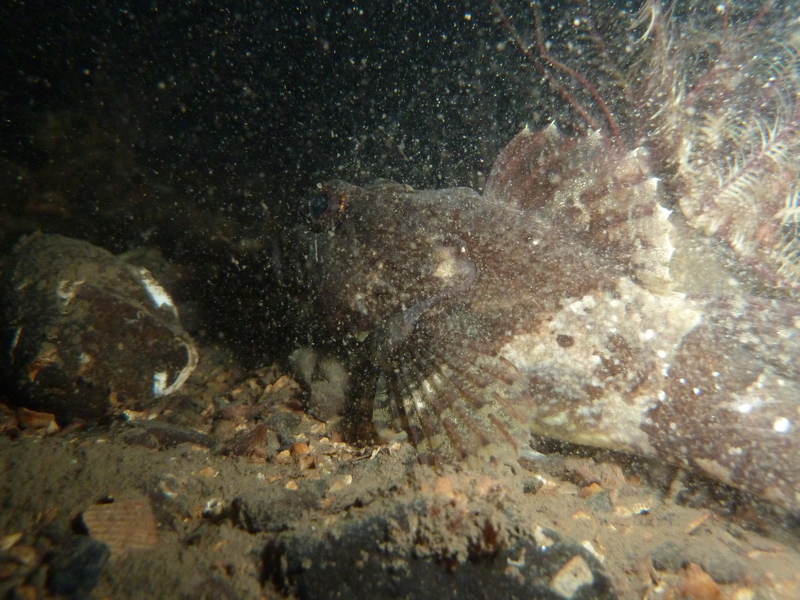 At the bottom we found twisted wreckage, possibly a gantry and set about picking up the odd scallop. I managed to drop my torch head (it’s an umbilical) and everything went black for an instant as the head came to rest in mud. As an exercise it was quite interesting as I fumbled with a goody bag, feeling lucky I hadn’t grabbed a crab! Looking around we had about 4m vis as I watched Steve illuminated by his torch, scarring the wildlife. 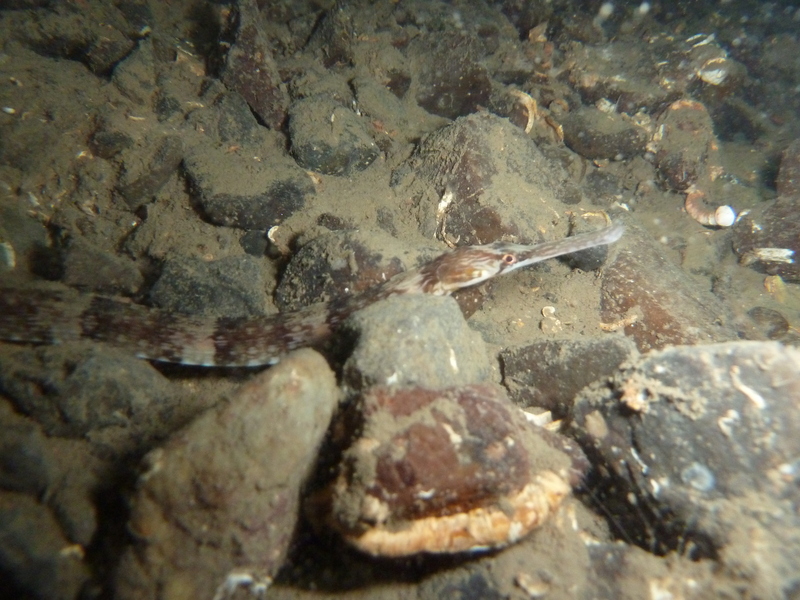 Conscious of the depth I was keen to ascend to eke out the air in shallower water, so we slowly ascended steep sand and gravel where we came across a pipe fish that was determined to play dead. Further up we found an enormous concrete cube, artistic in it’s architectural rococo style, clearly a mooring block of sorts but unattached and age unknown. Possible associated with the flying boats but who knows. Interesting life continued to find us as we climbed the slope, small scallops and flat fish and a large Scorpion fish that was determined to avoid being photographed as it deliberately stirred up sand around itself. Further up the slope we reached coarse sand and contoured back towards our start point trying to stay just below the halocline in the warmer water. Finding a few more pieces of wreckage, rusting iron and discarded bottles, we eventually surfaced as the cold fresh water took it’s toll. Tam expertly recovered us from the water and that was it, not a bad dive and much better than weather of late would have suggested. 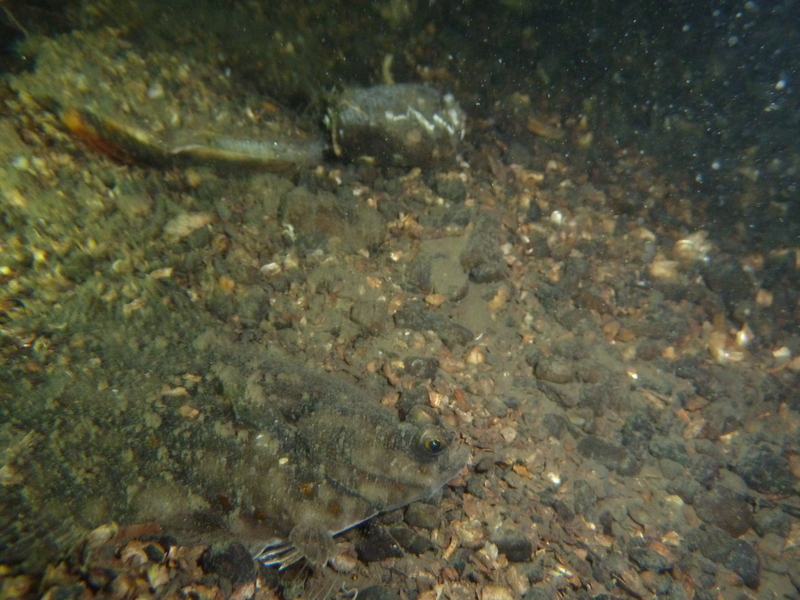 Alan and Dave surfaced shortly afterwards having completed a similar dive and recovering another bag of scallops for Christmas. Retrieval of the boat followed a well worn procedure and having washed it off and secured it all that was left was to have a quick trip to the dive shop for a natter, square up and head for home. A big thank you to Alan for the days diving and Steve for organising. Steve and I decided to say hello to the Badger and have a quick chat with Andy at the Crianlarich hotel. I am pleased to report that the quality of the Colonsay Ale is still excellent.